Have you thought about how you are going to quilt your hexagons? 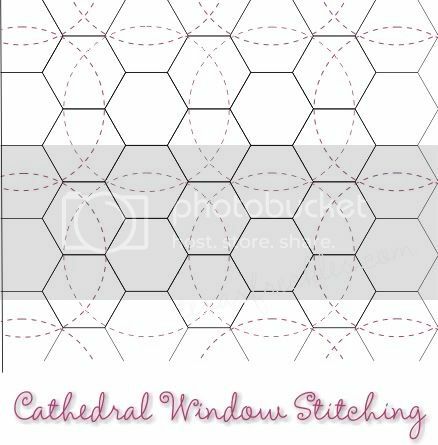 The first thought that comes to my mind is that I will probably want to hand quilt my hexagons because it almost seems a shame to machine quilt it after hand piecing. Below are a few hand quilting options I was thinking about. One thought was to quilt around the inside edge of the flower clusters. 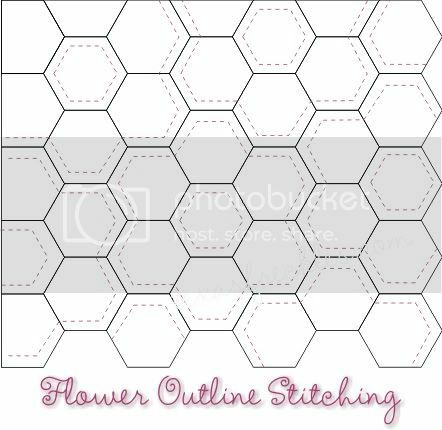 You could also quilt inside the center hexagon of each flower if you needed additional stitching to secure your batting. The most time consuming method, but my favorite, would be to quilt inside each hexagon. You could do multiple hexagons without tying off your thread by moving the thread from hexagon to another inside the quilt. This one looks a little strange in the diagram, but I think it would be very interesting on a quilt. It feels a little modern to me. This one looks peculiar in the diagram too, but I think it would actually work well. 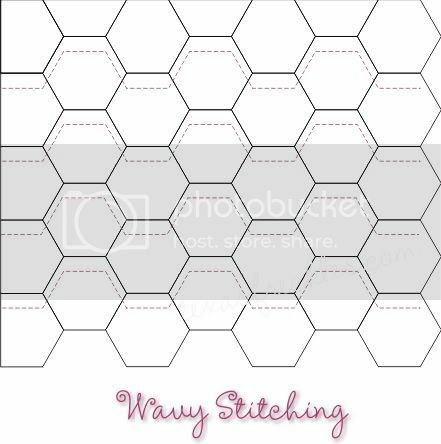 A major advantage of going with diagonal stitching is that you avoid the bulk in the corners of the hexagon by stitching only through the straight sides. Added on 4/27/10. Kait had a great suggestion and I think this is close to what she described. Another great choice! I know there are many more options for quilting patterns and I would love to hear your suggestions. What other interesting ways have you seen to quilt a hexagon quilt? Do you have a vintage grandmother's flower garden quilt that has interesting quilting? I am looking so forward to see what you decide to do with your hexagons. 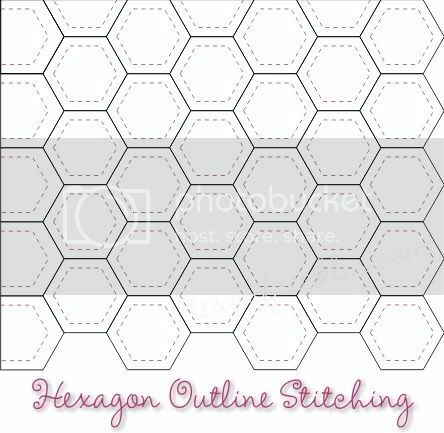 I am ordering the 1.5" templates today and begin making my very first hexagon quilt. I have really enjoyed visiting your blog this morning. I agree with you totally...after hand piecing all those hexes, machine quilting them would almost devalue all that hand stitching. I was feeling the exact same way about the hex quilt I am working on (but not at all happy with this new found need to hand quilt). 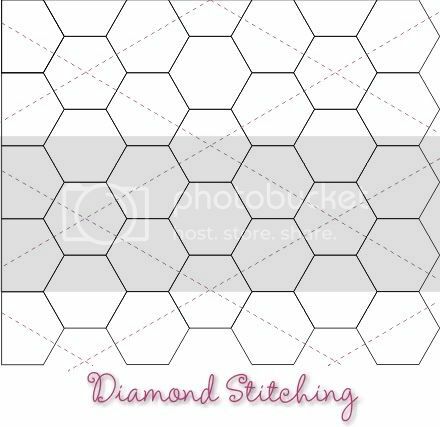 I like the thought of outlining the hexes the best, but think that the diamond stitching would be the easiest and quickest. Thanks for the ideas! I keep wondering how i'm going to manage the quilting aspect of this project too. Another one to try out on the practice quilt methinks! I am handquilting my hexagon table runner right now and I am following the outline of each hexagon. I do like the diamond stitching too! Oh definitely do the outline stitching. That would be divine. Crazy-amount-of-time-divine but worth it. I really appreciate the time that you've taken to do these diagrams of how to quilt your hexgons! I've never hand quilted my hexagons, and I've only machine quilted a pillowcase. Seeing your diagrams let me get a handle on what my options are - thank you!